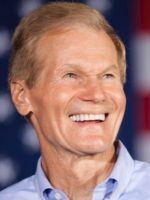 Bill Nelson was elected to the U.S. Senate in November 2000, after serving six years as a member of the Florida Cabinet. A week after being sworn in, he was tapped to fill a key leadership post as vice-chair of the Democratic Senatorial Campaign Committee. The leadership cited his ability to help recruit moderate candidates for the 2002 election cycle. Nelson also is a member of the Senate Foreign Relations, Armed Services, Budget and Commerce Committees. During the first session of the 107th Congress, Nelson fought to protect consumer privacy in several areas. He filed legislation to prevent banks and insurance companies from sharing consumers' medical information without written consent. He also introduced a bill to make it illegal to sell or buy a social security number. Worried about the potential health risks to children playing in parks with arsenic treated wood, Nelson filed a bill to require warning labels on arsenic treated wood sold in the United States. He also passed a measure requiring an accelerated EPA review of arsenic use. As a member of the Armed Services Committee, Nelson attached provisions to the defense budget expanding internet voting for the military. He also secured funding to replace training aircraft used by Navy and Marine pilots during flight school in Pensacola. On the Foreign Relations Committee, he urged Secretary of State Colin Powell to keep and support the country's Holocaust office. Concerned that insurance companies are again moving too slowly in providing restitution for thousands of unpaid Nazi-era insurance claims, Nelson successfully convinced the International Commission on Holocaust- Era Insurance Claims to extend its January 31 deadline for filing Holocaust-era insurance claims to September 30, 2002. Before his service in the Senate, Nelson served as Florida's treasurer, insurance commissioner and state fire marshal from 1995 to 2000, where he earned his reputation as a common-sense problem solver and strong consumer advocate. Nelson oversaw state finances and insurance regulation and led the rebuilding of Florida's insurance market in the wake of Hurricane Andrew - the most expensive natural disaster in U.S. history. Nelson was elected to the Florida Legislature in 1972, serving for six years. There, he fought for education reforms, and was a prime sponsor of Florida's pioneering local planning law enacted in 1975. He went on to serve in Congress, where he represented central Florida and became chairman of the Space Subcommittee of the Science, Space, and Technology Committee. He was an early advocate for balancing the federal budget, and a strong opponent of offshore oil drilling. As one of the leading congressional experts on NASA, Nelson underwent intensive training and flew as a crew member on the 24th flight of the space shuttle. Nelson is a fifth-generation Floridian. He was born Sept. 29, 1942 in Miami, and was educated in Melbourne's public schools. He is a graduate of Yale University and the University of Virginia Law School. Nelson served four years of reserve duty and two years of active duty in the United States Army, rising to the rank of captain. Bill lives with his wife of 30 years, Grace. They are the parents of two children, Nan Ellen and Bill.